The availability of tiny prey near a coral reef in the eastern Red Sea seems not to be the reason that whale sharks aggregate there every spring. In recent years, juvenile whale sharks have been discovered gathering at a coral reef, 4 kilometers off the coast of Saudi Arabia between February and May. This provides the opportunity for scientists at KAUST'sRed Sea Research Centerto study their behaviors. "Whale sharks are under threat from targeted fisheries and as bycatch and are listed as endangered by the IUCN Red List," says Ph.D. student Aya Hozumi. "However, we have limited understanding of their ecology and life history, which poses a challenge to conservation efforts." Whale sharks, with lengths surpassing 12 meters, are the largest fish in the world. They feed by opening their mouths to filter the water for tiny fish and floating organisms called zooplankton. 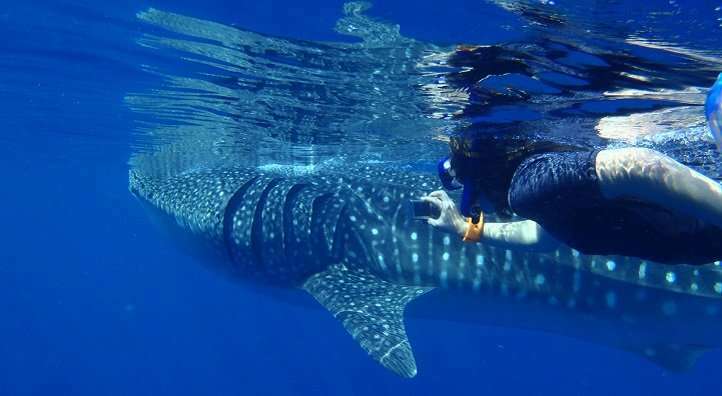 Hozumi and her colleagues wanted to investigate whether gatherings of whale sharks each spring near Al-Lith, Saudi Arabia, were due to rising levels of the zooplankton prey during the same season. The team, led by oceanographer Burton Jones with marine zoologist Stein Kaartvedt from the University of Oslo placed echosounders on the seabed close to coral reefs where the whale sharks are known to aggregate. Echosounders send sound pulses into the water, which bounce back as echoes when they hit very small objects, like fish, plankton, sediment or even air bubbles, Hozumi explains. Sound echos bounce back at different strengths, depending on what they strike, enabling researchers to differentiate between different kinds of small matter in the water. The team was surprised to find that the layer of tiny marine organisms in the area did not peak during the whale shark's spring season near Al-Lith. Instead, the levels of organisms in the study area were generally steady before, during and after whale shark season. Interestingly, the researchers were able to observe that these tiny organisms, most likely composed of fish larvae, followed an inverse diel vertical migration, occupying depths of about 15 to 25 meters during the day and traveling down to deeper depths close to the seabed at night. This type of migration may help avoid predators that migrate upwards at night and into deeper waters during the day. The findings did not support the assumption that whale sharks gather in the spring near Al-Lith due to rising levels of tiny prey during the same period. Further studies that look into how much time whale sharks spend at different depths could help clarify their foraging behaviors. Another possibility is that a nearby aquaculture facility is releasing nutrients or odors that attract the whale sharks to the area.